On April 6, 1941, Yugoslavia was invaded from all sides by the Axis powers, primarily by Ger­many but also by Italy, Hun­gary, and Bul­garia. The inva­sion lasted little more than ten days, ending with the un­con­di­tional sur­render of the Yugo­slav Army on April 17 and the flight of King Peter II and other mem­bers of his govern­ment from the country. The vic­tors occu­pied and dis­mem­bered the Balkan nation. They insti­tuted such severe bur­dens on the local pop­u­lace that the Parti­sans, a Com­mu­nist-led pan-ethnic resis­tance move­ment under Marshal Josip Broz Tito, grew to enjoy moral and ma­te­rial sup­port in­side and, to a lesser ex­tent, out­side the coun­try after Presi­dent Franklin D. Roose­velt, British Prime Minis­ter Winston Chur­chill, and Soviet dicta­tor Joseph Stalin decided in late 1943 to support Tito’s forces with sup­plies, equip­ment, and com­man­do opera­tions. (A rival resis­tance group, the mon­ar­chist and Repub­lican Chet­niks, was com­prised mainly of Ser­bians with limited pop­u­lar­ity out­side their home­land largely because they en­gaged in eth­nic clean­sing with­in borders they con­sidered his­tor­i­cally Ser­bia.) In late 1944, Tito’s forces num­bered 650,000 men and women organ­ized in four field armies and 52 divi­sions, and had a 3,000-strong navy and an air force. In a joint oper­a­tion with the Parti­sans, the Red Army entered Bel­grade on Octo­ber 20, 1944, evac­u­ated the day before by the Ger­mans, followed on this date in 1944 by the entry of Tito’s Parti­sans into the Yugo­slav capi­tal. Parti­san units en­gaged re­treating Ger­mans in the last battle in Europe on May 14–15, 1945, a week after Ger­many’s sur­ren­der to the Allies in Reims and Berlin. Yugo­sla­via was one of only two Euro­pean coun­tries largely liber­ated by its own forces during World War II. The other coun­try was the Soviet Union. Both nations suf­fered pro­por­tion­ately high casual­ties because Nazi Ger­many and its col­labora­tors in the occu­pied terri­tories and pup­pet states (e.g., the Inde­pen­dent State of Croa­tia in Yugo­sla­via) had an offi­cial geno­cidal agen­da with respect to the in­hab­i­tants living there, espe­cially toward Jews. Yugo­sla­via suf­fered just over one million civil­ian and mili­tary dead during the Axis occu­pa­tion. Some 300,000 civil­ians were killed by the Croa­tian ter­rorist organ­i­zation, Ustaša, in German-style concentration camps. Left: Yugoslavia’s Partisans, or the National Libera­tion Army, was Europe’s most effect­ive anti-Nazi resis­tance move­ment. 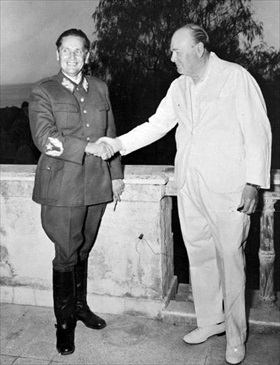 Its com­mander was Marshal Josip Broz Tito, shown here in 1942. Tito mostly played down his Com­mu­nist Party ties in favor of a Popular Front approach that appealed to all Yugo­slavs. 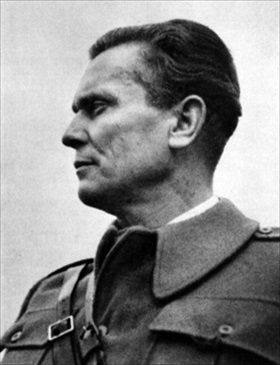 Tito’s rival was Draža Mihail­ović and his royalist Chetnik resis­tance move­ment. To the Chet­niks, Tito’s pan-ethnic poli­cies seemed anti-Serbian, where­as the Chet­niks’ royalism was ana­thema to the Com­mu­nists. From October 1941 relations between the two main resis­tance groups degenerated into full-scale conflict. Right: For most of the war in Yugosla­via the only source of Parti­san wea­pons was the enemy—Ger­many, Italy, other Axis nations, and pup­pet Yugo­slav mili­tia. It was not until 1944 when British supplies began to arrive in signifi­cant quan­ti­ties that a cre­dible offen­sive force took to the field. This pic­ture shows Tito and Brit­ish Prime Minis­ter Winston Chur­chill in Naples, Italy, in 1944, the year the Allies switched their sup­port from Mihail­ović and his Chet­niks to Tito’s Com­mu­nist Partisans. Churchill later regretted the switch. 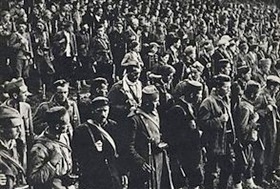 Left: Soldiers of the 4th Montenegrin Prole­tarian Bri­gade. Tito’s Par­ti­san organ­iza­tion was a multi­ethnic resis­tance force com­prising Serbs (44%), Croats (30%), Bos­nian Muslim (2.5%), Slo­venes (10%), Monte­ne­grins (5%), Mace­do­nians (2.5%), and Jews. By April 1945, when most of Yugo­sla­via had been liberated, Partisan forces numbered 800,000. Right: Yugoslavian Partisans operated along the Croa­tian coast of Hitler’s pup­pet state, the so-called Inde­pen­dent State of Croa­tia, run by the Ustaša, a fas­cist and ter­rorist organ­i­za­tion. 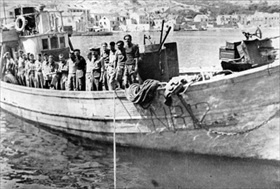 Tito’s Par­tisan navy raided Ger­man supply lines using a num­ber of light boats, often ex-traw­lers or fishing boats as shown in this photo­graph. The Par­ti­san navy had a num­ber of suc­cesses, par­tially assisted by a little Brit­ish naval unit of a half-dozen armed boats. Yugo­sla­vian Par­ti­sans forced a schooner of 400 tons full of sup­plies to sur­render after shouting, “Don’t shot or we will torpedo you,” even though the boat had no torpedoes.